4BR direct beach front home with private walkover to the beautiful white sands! Beach Front 4BR/3 BA - Private Walkway to Sand, Re-decorated and Upgraded - Beautiful! 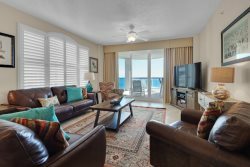 If you are looking for a charming gulf front retreat that offers the feeling of home – this is it! Bare Feet Retreat is one of Pensacola Beach’s vintage structures which holds the charm of the past yet has the modern conveniences of today. The views of the powder white sand and the crystal-clear water along with the sounds of the surf will make memories of a lifetime! What makes this gulf front home a unique find is it’s large screened in porch and private walkway to the water’s edge. Pensacola Beach has many beach properties but Bare Feet Retreat is a stand out! This home has just received a décor update. In doing so, the owner was adamant that the house continues to be a “beach home”, meaning the original wood and warm welcoming feel of the home must remain intact. The goal was to provide a current beach décor yet embrace the original features and charm of the home. Gulf Coast Getaways is pleased to provide this unique updated property! The bottom floor of Bare Feet Retreat has a drive-in car port that offers a perfect place to keep at least one car out of the elements. This is also a great spot to store floats, coolers, and additional beach equipment. The main level of the home is an open concept with a large great room, dining room, and kitchen. In this large space families can gather to cook, dine, and watch tv. The living room has plenty of seating with 3 large sofas’ (one of which has a queen size sleeper sofa), a large flat screen tv, and a quaint little electric fire place. The kitchen is fully equipped and there is plenty of room for a family meal as the bar area seats four and the farm house table has seating for eight. The screened in porch is a guest favorite for sure! This is a cozy place to get out of the sun yet still enjoy the views of the surf. This area has a comfortable hanging porch swing as well as an additional area to dine or watch for dolphins. Off both sides of the screened porch you will find open deck areas, perfect for the sun lovers! Also on the main level of the home guests will find a large master suite complete with a flat screen tv and a sliding glass door that leads to the deck. This is a sun filled room with sweeping water front views of the sand and surf. It is also sizable enough to have room for a king bed and a full bed. The lay out conveniently enables families with small children to sleep in the same room with parents. The adjoining master bathroom has a large vanity as well as a soaker tub and a separate shower. On the other side of the home guests will find two bedrooms and a full bathroom. One of these bedrooms is direct gulf front with a king-sized bed, a flat screen tv, and a large sliding glass door to the sun deck. The second bedroom sleeps four with a queen bed as well as day bed with a trundle underneath. This room also has a flat screen tv. The third level of this home is an inviting bonus room, second master BR with a renovated full bath. This bedroom features a king bed, full bathroom, mini kitchenette, and awesome gulf front deck! While the rest of the house has beautiful views of the gulf this room has the most stunning views of all. You will not want to miss out on enjoying these unobstructed long range views of the Gulf of Mexico!